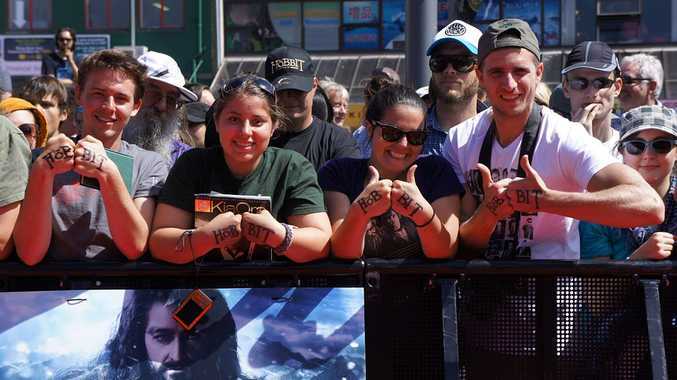 THOUSANDS of fans lined half a kilometre of red carpet for the world premiere of The Hobbit in Wellington today. The hype leading up to the big-budget debut of director Peter Jackson's new trilogy boiled over as the crowd cheered for the international cast. Lord of the Rings alumni Elijah Woods, Cate Blanchett, Hugo Weaving and Andy Serkis were joined by a new group of actors starring in The Hobbit. Martin Freeman leads the charge as Bilbo Baggins, who joins 13 dwarves on a quest to reclaim their homeland. "He's the heart of the movie," said Elijah Wood, who reprises his role as Froddo. James Cameron came along to show his support for Jackson and "a unique event in the history of cinema". Sir Ian McKellen (Gandalf) was the only main actor not in attendance. He sent a video message from London and jokingly asked "Is this in 3D?". Neil Finn played a half-hour concert before the stars arrived, including the new song he penned for the film. The Hobbit: An Unexpected Journey opens in Australia on Boxing Day.